December 22 was the anniversary of my very first flight. After a 38 year delay, I’m finally getting around to writing the trip report. I would like to have finished it sooner, but I got busy: first grade, addition, subtraction, learning to read, cursive, programing on my Apple IIe, getting a drivers license, college, keg parties, finding a job, apartments, career changes. But the fault wasn’t completely my own, I had to wait around for a few things to happen: the internet, the web, browsers, and blogs. My family had moved to Denver from Texas during the summer of 1973, and in December of that year we flew from Denver to Dallas to spend the holidays with family in Texas and Oklahoma. I was six years old and had never been on an airplane. Despite this being my first time, I wasn’t nervous about the flight. Dad traveled pretty frequently, so I had been to the airport a few times to greet him when he returned home from a business trip, and I always enjoyed a trip to the airport and loved to see the planes. He had told me what to expect, and had explained to me how something as big and heavy as an airplane was able to fly. And though I’m not sure that I completely understood the concepts of lift, thrust and gravity, I was still eager for my first trip. Unfortunately, American Airlines hadn’t invented the frequent flyer program yet, so I didn’t earn any miles. But award travel wasn’t a big priority for me back then, I was on an expense account of sorts, and didn’t have to pay for airfare anyway. We were traveling on the Saturday before Christmas and for some reason we took a cab. As we got closer to Stapelton International Airport I could see the airplanes taking off, and my excitement started to build. After what seemed like a pretty quick ride, we got to the road leading up to the terminal and crossed under one of the taxiways, as a golden tailed, Continental Airlines 727 passed over us. 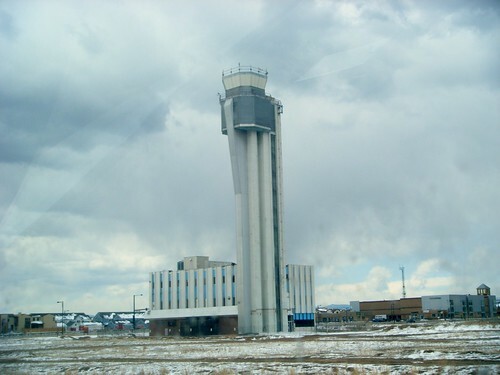 Stapleton was Denver’s main airport until it closed in 1995 when the new Denver International Airport was opened. I don’t think that the true “hub and spoke” system was in place yet (deregulation was still five years away) but the airport was a pretty big base of operations for United, Continental, Frontier, and Western Airlines. I don’t recall much about the airport, but I do vaguely remember that there were pay toilets, and that you had to drop a coin into a box of some sort on the bathroom stall door in order to use the bathroom. New Mexico architect Alexander Girard, Italian fashion designer Emilio Pucci, and shoe designer Beth Levine were called in, and with this new creative talent, Braniff began the “End of the Plain Plane” campaign. At Girard’s recommendation, the old livery was dropped in favor of planes painted in a single color, selected from a wide palette of bright hues. Girard wanted the planes painted from tail to nose in colors like “Chocolate Brown” and “Metallic Purple.” He also favored a small “BI” distinctive logo and small titles. 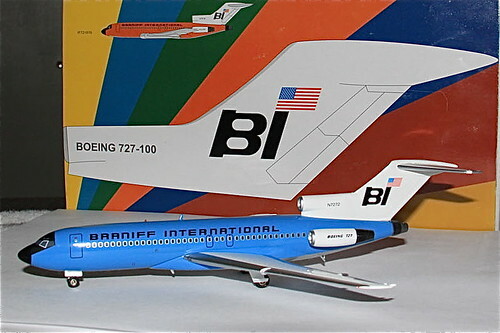 Braniff engineering and Braniff’s advertising department modified Girard’s colors, enlarged the “BI” logo, and added white wings and tails. The new “jelly bean” fleet consisted of such bold colors as beige, ochre, orange, turquoise, baby blue, medium blue, lemon yellow, and lavender (lavender was dropped after one month, as lavender and black were considered bad luck in Mexico). Girard also outfitted the interiors with 57 different variations of Herman Miller fabrics. 15 colors were used by Braniff for plane exteriors during the 1960s (Harper & George modified Girard’s original seven colors in 1968). Many of the color schemes were applied to aircraft interiors, gate lounges, ticket offices, and even the corporate headquarters. Art to complement the color schemes was flown in from Mexico, Latin America, and South America. The Denver to Dallas flight is only about 650 miles, but it seemed like a much longer flight at the time. My little brother and I were seated next to each other in coach. I got the window seat at takeoff, he got it for the landing, and there was not middle seat. A new superjet address, and only Braniff has it. Fly “727 Braniff Place” and coach travel will never seem the same again. You’ll enjoy a first class feeling in our new 2-and-2 seats. No middleman on most flights. There’s a new high, wide, and handsome superset interior, too. Enclosed storage compartments that fold up into the ceiling so you have honest-to-goodness headroom. New lighting, new window treatments, new fabrics, new colors, too. Personally, you’ll like flying Braniff Style. After the aircraft door was closed, we pushed back from the gate and the flight attendants started the safety demonstration. My brother and I paid close attention and I remember being impressed with the fact that oxygen masks would drop from the ceiling if we had an emergency. As one pilot said, “You don’t just lower the flaps on this baby–You take the whole damned wing apart.” The 727 wing completely transforms during landing, generating extraordinarily advanced, high-lift devices. When the flaps are tucked away, the slim wing slices through the air giving the 727 extremely high cruise speed. And one memory that I doubt I’ll ever forget, was watching the shadow of the wing as it passed over the apron of the runway; watching the lines on of the tarmac pass under it, the detail of the runway becoming a blur. Watching as the shadow seemed to drop away as the plane lifted from the ground. Steeply angled, we advanced into the sky…and I fell in love with flying. Even now, it’s really not about the miles, it’s about that moment. The flight crew was friendly and helpful. My mother and sister were sitting across the aisle from us. One of the flight attendants stopped and chatted with my two year old sister who wanted to show off her furry, red cow purse. The beverage service began and my brother and I both ordered a Coke, which was served in a short, clear plastic glass with a Braniff swizzle stick. Amazing. Lunch was served and we were given a choice (I think) of a hot or cold lunch. My brother and I both ordered the hot lunch: Swiss Steak, rice, and a roll served with butter that had the Braniff logo pressed into it. I had never had Swiss Steak, and was kind of grossed out by it (at six, I liked my food plain and separated with no food item touching another) but I summoned up the courage and tried it, and actually enjoyed the meal (though I haven’t eaten Swiss Steak since). Soon after we finished eating, it was time to land. My brother and I switched seats, so even though I leaned over him to look out the window, I didn’t get to see much. It wasn’t until the return flight to Denver that I got to sit by the window during landing. Jetrail was a suspended monorail system that operated at Dallas Love Field in Dallas, Texas, from 1969 to 1974. It was built for and operated by Braniff International Airways to transport passengers and their luggage from remote parking lots to the airport terminal. Jetrail was the world’s first fully automated monorail transit system. The whole experience was wonderful. 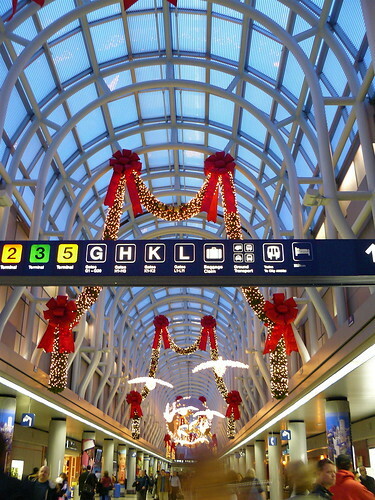 But the best part about the flight, was that it brought me and my family across what seemed a great distance (to a six year old), so that we could be with my aunts, uncles, cousins, and grandparents for the holidays. I hope it’s much the same for you, and that whether you’re traveling or staying home this holiday, you’re able share it with people you care about and that you’re surrounded by those that care about you. To close out this trip report, I wanted to share two videos with you. The first video is of my favorite American Airlines commercial: the music makes me want to fasten a seatbelt and it’s perfect for this time of year. Stay safe, have fun, and Merry Christmas! awesome report, thanks. a family friend used to pilot for Braniff. good memories. I think that is insane. My parents took us to the airport as well before flights and to pick up family since they lived in Florida and us in Boston. I always remembered being at the airport! We also lived close by and would always see landings and take offs. We are also able to go behind security and hang out at the kidport at Logan. Its nice to hear other people had similar initial experiences!